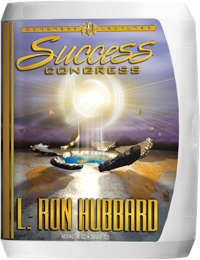 At the Success Congress, L. Ron Hubbard revealed discoveries about the senior ability of a thetan to bring order and, hence, provide leadership. None embody those qualities more than the auditor—and thus the 21st American ACC signaled a new phase. Vastly expanding the reach of a single professional auditor, Mr. Hubbard taught the breakthrough of Muzzled Auditing—cracking the barriers posed by the inexperience of co‑auditing teams and permitting anyone to engage in clearing under professional supervision. And with Confront and Training Drills (TRs) as the first vital step, he released coaching technology to cut through all confusions. Then, detailing the application in Muzzled Auditing of specific processes—Selected Person Overts, General Overts, Not‑Is Straightwire and ARC Break Straightwire—he told auditors, “By running these processes on an individual and getting an individual to run these processes, we wind up with an auditor with judgment, with intelligence, with the ability to reach and with his obsessive not‑is gone—which permits him to grant a little beingness.” Here, then, are the technical and administrative solutions to put entire populations in session, laying the groundwork for what L. Ron Hubbard next revealed—an actual formula to accomplish a Cleared Earth. With trained auditors now able to make Clears routinely, L. Ron Hubbard had brought technical application to a pinnacle. Thus, with news of his breakthroughs already whipping through the field, in the opening days of January 1959 he delivered the renowned Success Congress to a packed Shoreham Hotel auditorium in Washington, DC, where he not only released Scientology Engram Running but revealed startling discoveries about the senior ability of beings to bring order and provide real leadership. 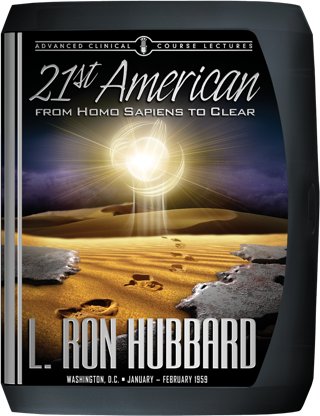 In point of fact, with these discoveries and all they would lead to, Mr. Hubbard was setting the stage for global expansion far exceeding anything previous—expansion on the scale needed to actually clear a planet. In readiness, he had scheduled the launch of the 21st American Advanced Clinical Course immediately following the Congress, and his office had been swamped with applications. Indeed, as a measure of the intensity of that demand, notwithstanding that all applicants had to meet strict criteria to qualify, on the morning of 5 January 1959 well over one hundred top auditors were on deck when the course began, cramming the now popular ACC venue at the corner of R and 19th Street NW in Washington, DC. The schedule was rigorous and the ACC tightly run, with daily classes starting on the dot at 7:55 a.m. and ending with equal precision at 8:00 p.m. And with good reason—requirements included all students be up to the minute on the latest technical breakthroughs: Specifically, a full review of all 40 lectures Mr. Hubbard had given just a few weeks earlier at the 5th London ACC. And with that data under their belts, expectancy was high and all students primed when he stepped into the building to deliver the first in a series of what he called “supplementary” lectures—not merely refinements of procedures, but the underlying principles and training steps required to effectively see to application planetwide. What that included was a fundamental distillation and restatement of the breakthroughs gained from those years of research, discovery and experience—from two-way communication to the importance of the auditor taking full responsibility for the preclear. Furthermore, and consistent with Mr. Hubbard’s focus on relentlessly working to provide technology to undercut both the state of cases and skill of auditors, there came new developments uniquely released at this ACC: In particular, the coaching technology to cut through all possible confusions regarding Confront and Training Drills (TRs); then again, as regards cases, the pivotal importance of auditing preclears at their level of reality. Thus, he instructed auditors on how first to establish and then raise the reality of the preclear, simultaneously increasing their cause level. And with those basics drilled into the bones of every auditor on the ACC, the time had come to teach them how to embrace a far wider zone of influence. In that regard, the 21st ACC is no less than historic. For this is where Mr. Hubbard instructed ACC students on how to set up and organize co-audits for planetary salvation. Rather than two trained auditors pairing off together, unlimited numbers of preclears paired off and all in session at the same time. As for how, what he revealed was the technology for a single Professional Auditor to in fact conduct every one of those sessions through co-audit teams trained on the barest essentials. And at the foundation of that technology was the breakthrough of Muzzled Auditing, virtually cracking the barriers posed by the inexperience of co-auditing teams and enabling anyone straight off the street to engage in clearing. Straightwire—Dynamic Straightwire, Selected Person Overts, General Overts, Not-Is Straightwire and ARC Break Straightwire. As for what resulted from that ACC, not only did a parade of Clears come shining off the course, not only did the training developments become the very foundation for Professional TR training to this day, but here’s where Mr. Hubbard provided the technical solutions and administrative know-how to put the entire population in session. Thus was laid the groundwork for what he next revealed: an actual formula to advance that accomplishment to the final product of a Cleared Earth. These recordings have never before been available and are presented here for the first time.